Found these on a thread from 2006. Curious if either one is still around. I can find Saturn ones but not Sky. Would be interested if anyone has one or knows how to get one. Thanks. Preferably the one on the left but either is ok. I was looking for any sort of Sky key chain and found nothing. I am going to have one custom made for myself by a buddy who does CNC stuff. Most likely it will just be SKY with the Redline logo, powder coated and polished. I've found a few for other Saturn models, but the only Sky key chains I've found look pretty cheap. 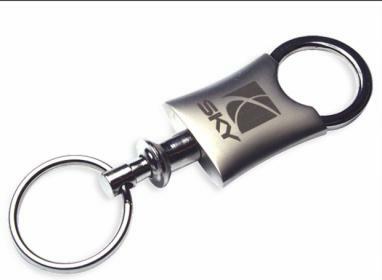 I have not found any Sky key chains, even cheap ones. Found 2 for Saturn, $18.00 and $15.00 I believe but just Saturn. If anyone coughs one up I am interested. I had one ...the left one back when....there is a problem with this key chain....it has to do with how the key hangs. Cannot recall the exact problem but was not happy. Well if I can find one fine, if not, no big deal. Just thought it would be nice. Custom make one? CNC or maybe 3-D printing could make just a SKY body outline, with color/material choice options for owner personal favor? IF yours is Yellow/Black like Moosebreath is then polished yellow powder coated piece, maybe a sliver of carbon fiber here and there, you could have something special. Cost a few bucks, little running around for a key chain but it only goes to your car. Then the $1.89 chain from Dollar General made in China breaks and you lose your keys... maybe one of your buddies still in the boat building business might have something laying around the shop you could use for " project " usage. You never know until you ask? Hell if yours turns out well enough, " could be " a new sideline business for you. Materials of choice, free time on hands, tools in work shop going unused, beers involved, new business market ventures capital, shares goes public, new wall street wonder gets on CNN money watch... and all I wanted was a new key chain for my Sky. If you do this, I'd be interested in buying a couple also. Wow! Did I go back to the future? I'm goin down to the Jag dealer right now!